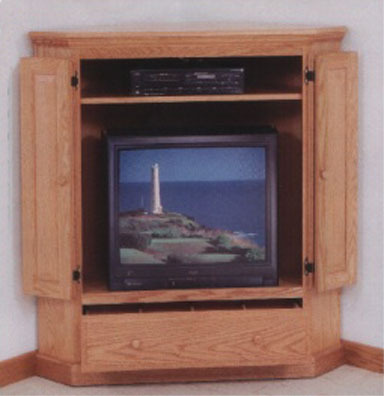 Our smallest Amish made corner entertainment center available without custom designing one just for you, the 50” is just a shorter version of our single-drawer 60” unit. It features one drawer at the bottom, with handy tape dividers, one adjustable shelf, and a pair of attractive oak bi-fold doors to cover up the TV space. 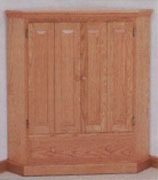 Amish craftsmen make it out of the same solid oak (or cherry) hardwood as all of the other entertainment centers, and with the same fine quality and precision. This single piece unit stands just over 4 feet tall, and is the perfect choice for the budget conscious person who may only have a little space, or a small TV, but still wants the best.